MFF was one of five winners out of 51 nominees to receive an award. 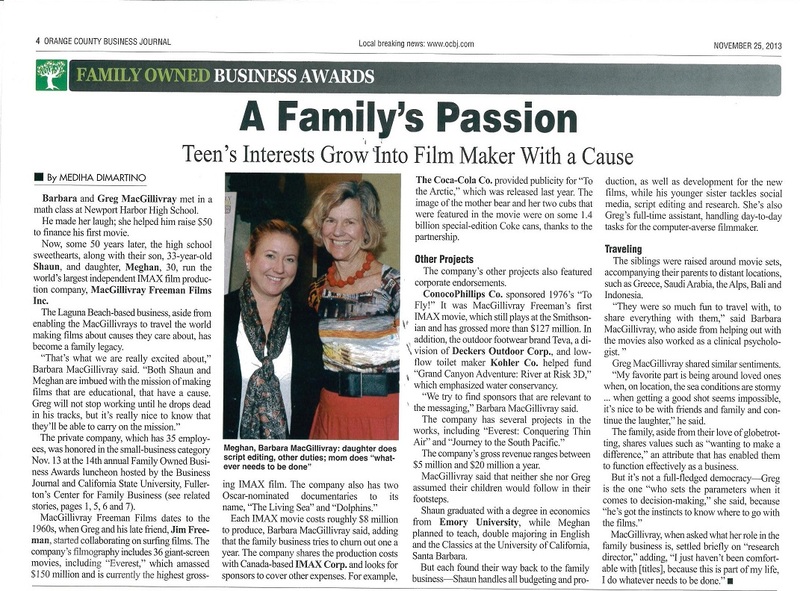 LAGUNA BEACH, CA – Dec. 4, 2013 – MacGillivray Freeman Films (MFF) was honored at the Orange County Business Journal's Fourteenth Annual Family Owned Business Awards ceremony held November 13 in Irvine, California. MFF was one of five winners out of 51 nominees to receive a Family Owned Business Award, winning in the Small Business Category (for businesses with fewer than 50 employees). Presented by the Orange County Business Journal and Cal State Fullerton's Family Business Council, the awards recognize family-owned businesses for their business success and longevity, family involvement, and contributions to their industry and to the Orange County community. Other businesses to receive awards were Dana Wharf Sport Fishing, Behavioral Health Works, Rogers Gardens, and Nektar Juice Bar. "MacGillivray Freeman Films is extremely proud of this recognition by the Orange County Business Journal and of our association with all the illustrious guests, nominees and winners," said company chairman Greg MacGillivray. "For fifty years, MFF has endeavored to create meaningful, life-enriching motion picture entertainment for global audiences and to be an engaged and supportive member of our community. We feel privileged to be able to make the kind of films we do, and we look forward to many more years of transporting audiences to far-away places with the power of IMAX cinematography." The award was accepted by Barbara and Meghan MacGillivray who were also interviewed for a piece in the Orange County Business Journal.